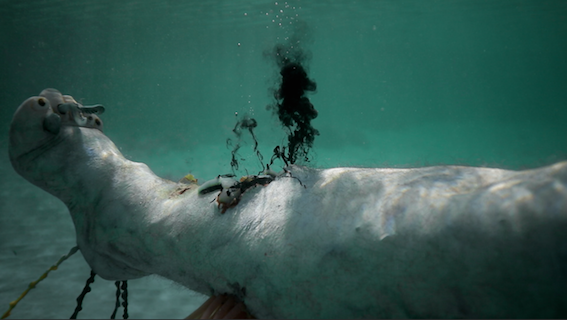 Taking a true event as a starting point, Open Water: The Offering is based on an incident that occurred in 1965 in the coastal town of Albany when a well-known whaler and gunner on The Cheynes III (a whale chaser) lost his leg after it became entangled in a rope attached to a harpoon fired at a whale. The film charts the imagined journey of a detached human leg, gifted to the Southern ocean and its inhabitants by an otherworldly cetacean. The bloated, grotesque leg is gradually colonised by endemic marine species of fauna and flora, transformed into a dark, phantasmagorical island. 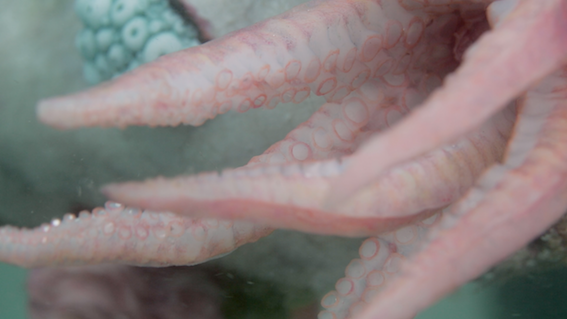 Shot entirely in the coastal waters off Perth, Open Water: The Offering merges nature documentary with Cronenbergesque body-horror. It offers a darkly magic realist version of maritime history in regional Australia, considered from the perspective of the ocean and its inhabitants. Shot on location in Perth, Western Australia. No animals were used in the production of this film.